Prerequisite: Glass cutting experience necessary. Beginning Fusing experience helpful, but not required. 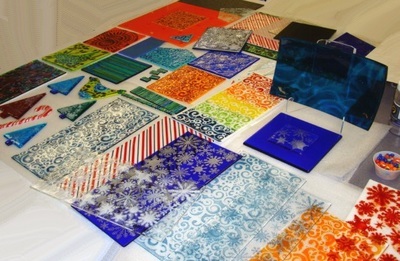 Jennifer will show you how to fabricate your very own custom sheet glass for use in fusing, mosaic and stained glass creations. 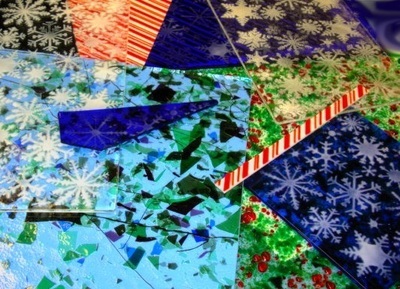 Start with your choice of base glass, then add glass powders, frit, stringers and confetti to create "designer" glass sheets which you can later cut into shapes for use in a variety of projects. Students will design their glass sheets in week one, then cut it up for use in a fused glass bowl or platter in week two. 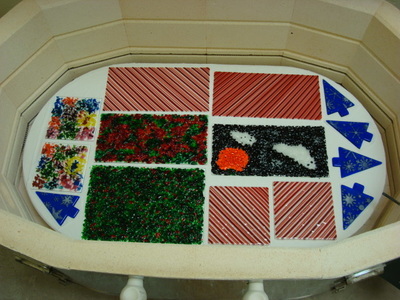 Or, you may create more sheet glass in the second week instead of making a bowl. Popular Designs: Snowflakes, Stripes (for Elf Stockings, Candy Canes, Snowman Scarves), Confetti and Stringer Glass, Quail Wings, Roadrunner and Javelina Fur, and many more.